This came as no surprise as Amy is a professional Creative Director, having worked with a couple small brands you might have heard of before ðŸ˜‰; Victoria's Secret, White House Black Market, Revlon, Vogue Mexico, Harper's Bazar, Target, West Elm, Bloomingdales and William-Sonoma, just to name a few. The site design is very dynamic, so you'll absolutely want to take a peek at it live, not just browse through the photos here! We utilized parallax scrolling in some creative ways, and hacked the Squarespace gallery block to rotate through all of her 'past client' logos. 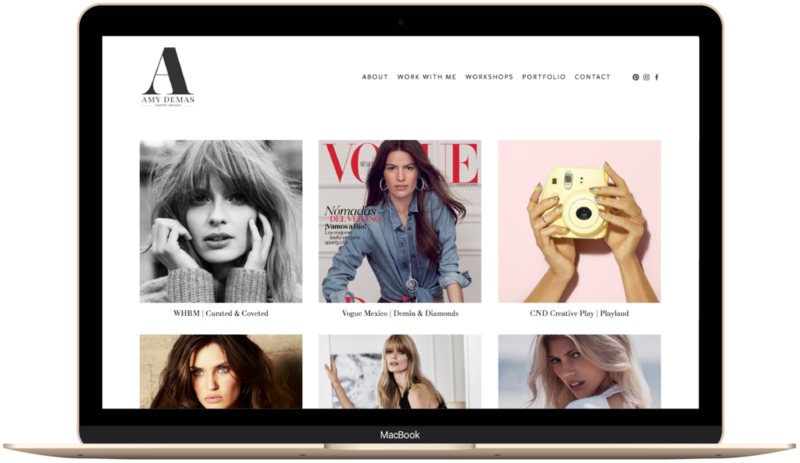 We also utilized video backgrounds to quickly display her portfolio of campaigns and shoots she had directed with major brands, right on the Home page and About pages, two of the most visited pages on any site. In just 2 weeks I created her the full site, logo, secondary logos, business cards, an opt-in gift, and set her up to take payments both via Acuity Scheduling and Hello Bonsai. Amy added to the studio's 5 star reviews on Facebook with these kind words.